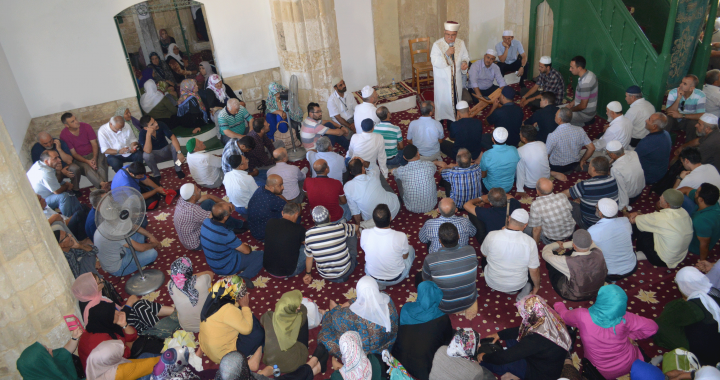 On the occasion of Eid Al-Adha or Qurban Bayram, the Mufti of Cyprus, Dr Talip Atalay led prayers this morning at Hala Sultan Tekke for around 1000 pilgrims of Turkish origin who reside in the northern part of Cyprus. The Eid al-Adha or Qurban Bayram in Turkish is one of Islam’s holiest festivals celebrated annually around the world and marks the end of the Hajj to Mecca. This is the seventh such pilgrimage to Hala Sultan Tekke since 2014, when for the first time H.B. Archbishop Chrysostomos II of the Church of Cyprus and H.E. Dr Talip Atalay, Mufti of Cyprus agreed together to support the right of Turkish origin nationals, living in Cyprus, to worship at the Mosque in Hala Sultan Tekke, which is considered the most significant Muslim place of worship in Cyprus. H.E Mr Ioannis Kasoulides, the Foreign Minister of the Republic of Cyprus, granted permission for special crossings in support of the religious leaders unprecedented agreement for religious freedom and the right to worship, which is supported by the Greek Cypriot and Turkish Cypriot political leaders of Cyprus. Since then special pilgrimages to Hala Sultan Tekke have been taking place annually on the occasions of Eid al-Fitr, Eid al-Adha and Mawlid, organized by the Muftiate of Cyprus, facilitated and coordinated by the Office of RTCYPP with the cooperation and support of UNFICYP. This agreement was reached within the framework of the Religious Track of the Cyprus Peace Process under the Auspices of the Embassy of Sweden (RTCYPP).